Metal doesn’t have to be a part of your smile. With Tooth-coloured fillings, you don’t have to choose between having a beautiful smile and having teeth that are strong and durable. Fillings made from ceramics can help out a tooth in trouble due to decay or injury, or replace outdated fillings that have caused tooth damage. Dr. Heinrichs provides tooth-colour fillings so patients can restore original tooth strength and protect teeth from decay and damage. The composite material we use for our white fillings is completely safe and does not carry some of the risks that metal fillings can. 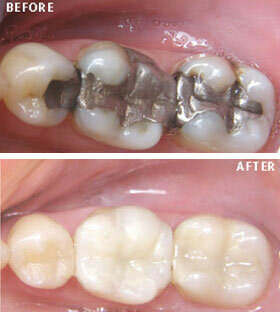 First, any decay is removed from the damaged tooth. Then, the tooth is prepared with a mild solution. The composite material is placed layer by layer, and then hardened with an ultra violet blue light. The filling is then shaped and polished. You’re left with a newer, stronger tooth that can last several years and aesthetic results that look like you’ve never had a filling. For patients who have larger areas of decay, a white filling may not be the best option. A porcelain inlay, onlay or crown may offer a better alternative. Consult with our Dental Team to see if Tooth Coloured fillings are an option for you.